A simple browser-based utility that draws ASCII tables. Just press a button and you will instantly get an ASCII table. Fast, free, and without ads. Press a button – get an ASCII table. Created by nerds for nerds. Column Order The order of columns. Column Names Display names for columns. To define column order, use their aliases separated by a comma: "bin,ascii" will only display Binary and ASCII columns in that order. Use "bin", "oct", "dec", "hex" or "ascii" as aliases. Column Text Colors Text colors for each column, separated by a comma. Column Backgrounds Background colors for each column, comma-separated. Color Picker Use this color picker to select colors from color palette. Has no effect. Select Character Set Which ASCII charset to use? Rows Per Table How many rows per column? Cell Padding Padding for each cell in pixels. Font Size Size of text in each cell. Cell Border Color Border color of table cells. Border Width Width of border in pixels. Ascii table drawer tool What is a ascii table drawer? This tool draws custom ASCII tables. You can customize the columns' content and display ASCII symbols and their representations in binary, octal, decimal and hexadecimal numeral systems. You can change the order of these columns, change the column titles, choose which columns to display and even duplicate them. Text and background color of every column is customizable. You can also set the border for each cell, cell padding, border color, border width and font size. You can choose how many columns to use in a table and choose between 7-bit and 8-bit (latin1) ASCII character sets. 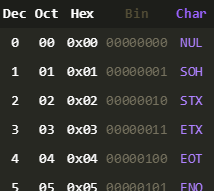 This example generates a dark-themed ASCII table and displays decimal, octal and hex values in white, binary in gray and ASCII symbols in purple. 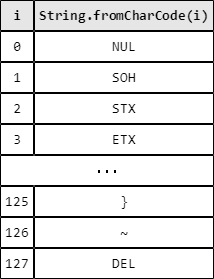 This example draws a light-themed ASCII table and displays hex, then just for illustration two rows of binary, then the ASCII symbol with custom colors and titles. In this example each column has 5 rows. This example draws a basic 7-bit ASCII table with 1 column and 128 rows. This results a very long image with no breaks.